Emotional Intelligence for “impulse control” is booming in California and New York. In Georgia, awareness of Emotional Intelligence is waking up and is being used to help separate yourself from others in job interviews and for the employer to screen applicants from a wide choice of great candidates. 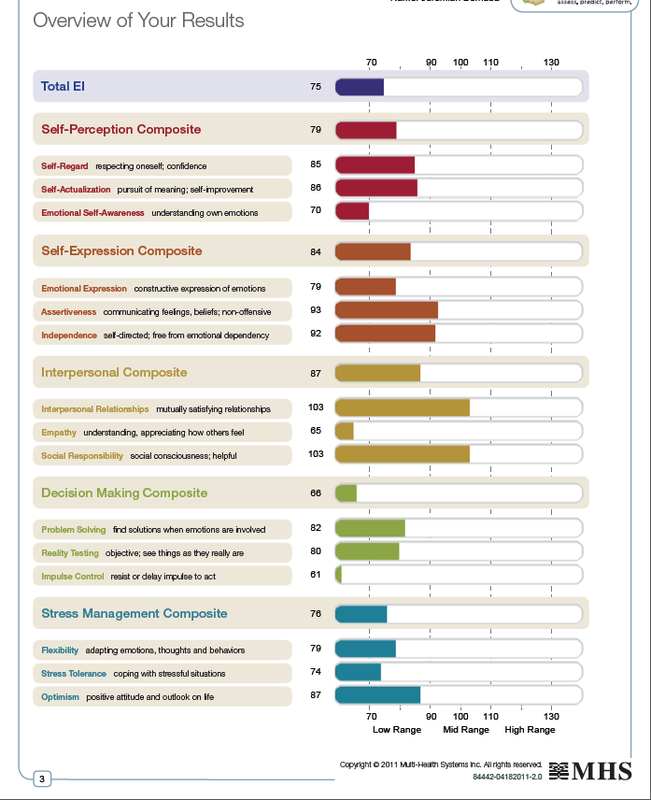 The key to this trend is the power of Emotional Intelligence Assessments in identifying low levels of competence in a number of skills (15 competencies in all) that are important in successful impersonal relationships and greater performance in life. Documentation shows it improves annual salaries and school performance in any Emotional Intelligence book. An increase in self-referrals for skill enhancement coaching for “impulse control” is happening. Satisfied clients are referring friends and colleagues. EQ coaching is becoming more popular with college students and young professionals wanting to improve themselves, wanting a better “edge” in the job market. The key is to actually invest in the coaching component using the 21 page EQ-i 2.0 Assessment Report for the basis of SMART GOAL enhancement. Your Report is awesome, however, just like at the gym you need someone to hold you accountable and keep doing the improving work. It also makes it personal to your individual situation and problems. Without coaching a person soon return to old habits that do not enhance their lives. 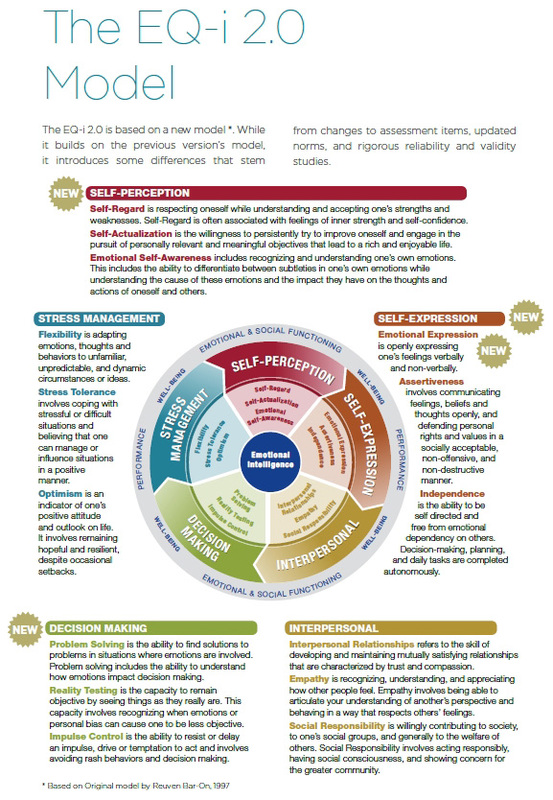 Call or e-mail Director Richard Taylor of Atlanta Anger Management to set up a Bar On EQ-i 2.0 Emotional Intelligence Assessment today. Spouses, parents, significant others. career coaches, and employers are encouraging their family members and employees to take advantage of the opportunity to increase their skills in self-awareness, self-control, social awareness, empathy, and relationship management. Emotional Intelligence has been shown to be a better predictor of success in life, marriage, work and school than IQ. Even Monster.com is advocating for the volunteer completion of Emotional Intelligence Assessments on the part of job applicants seeking positions in sales, customer service and leadership positions. 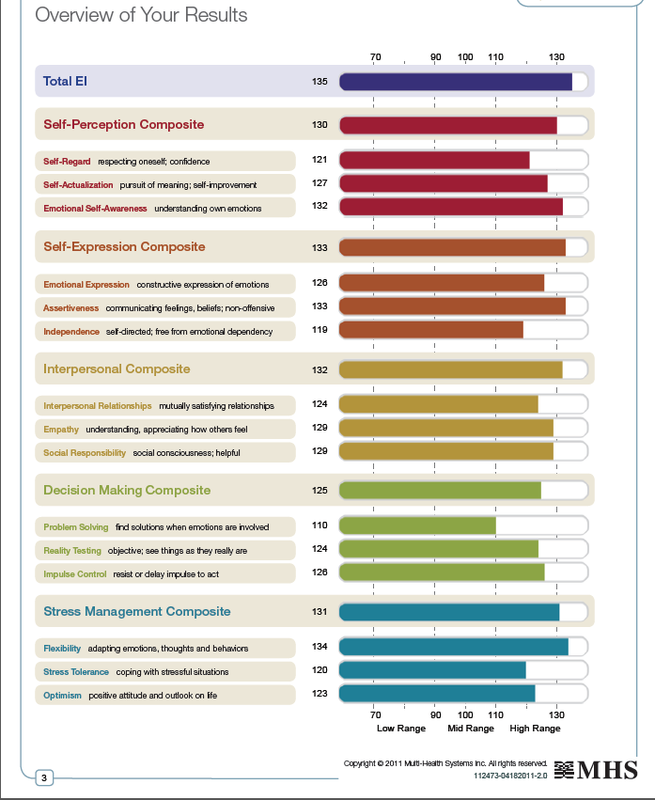 Coaching for skill enhancement in all emotional intelligence EQ-i 2.0 15 scales actually works. Motivated clients willing to complete an average of six months of coaching that include a Pre and Post Test can improve their ability to manage stress, anger and the 15 competencies. Let’s take a look at the results of coaching for this 21 year old young man who had everything but positive emotional intelligence skills. He was mandated by a court to take eight (8) classes of Anger Management after being arrested for punching a hotel casino manager in the face. He took the Bar On EQ-i 2.0 Emotional Intelligence Assessment before he started his Anger Management program. Once he received his results and saw how accurate they are, he decided to volunteer for Emotional Intelligence Coaching after he completed his required eight sessions of Anger Management. He saw us once per week for five months. We can conduct the Assessment anywhere in the world since it is an Online Assessment with 133 questions to answer. It takes 13-20 minutes to complete. 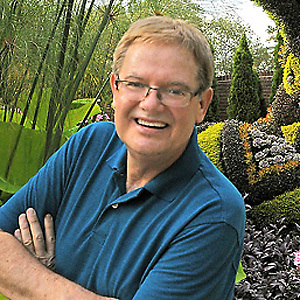 The coaching can be done in person in Atlanta, GA or over phone or Skype. Call or e-mail Director Richard Taylor of Atlanta Anger Management to set up a Bar-On MHS EQ-i 2.0 Emotional Intelligence Assessment today. PS: Often we take the time to address each of the 15 Scales so the length of coaching can be determined by how much time that takes. Emotional Intelligence, The Next Generation. The Anderson & Anderson™ Anger Management Model includes Emotional Intelligence as one of its key components. Anger Management Accelerated One Day Trainings (Intensives). 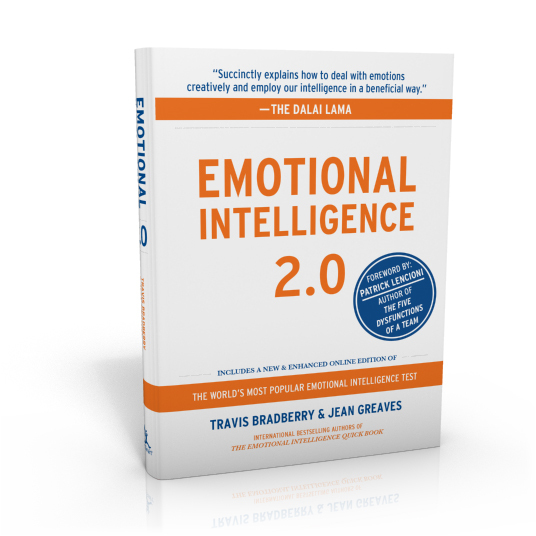 Emotional Intelligence has become one of the hottest buzz words in the business world. When Harvard Business Review published an article on the topic a few years ago, it attracted a higher percentage of readers than any other article published in that periodical in the last 40 years. Emotional intelligence is the capacity to appropriately respond to emotional stimuli in a way which leads to positive outcomes in yourself and others. 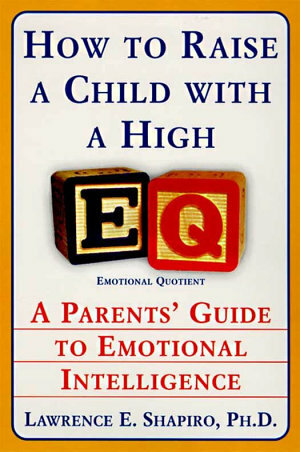 (EQ) is a learned ability to identity, experience, understand, and express human emotions in healthyand productive ways. It is a relatively new concept which was popularized in 1995 by Dr. Daniel Goleman in two books; “Emotional Intelligence” and “Emotional Intelligence At Work”. when a person is under stress or anger. Emotional intelligence provided an intervention with a different set of skills which includes managing anger, stress, improving communication and emotional intelligence. Emotional Intelligence is a key component in the Anderson & Anderson™ Model of Anger Management Intervention. In contrast to IQ, which is the ability to manipulate objects and master precision learning, emotional intelligence can be changed, improved at any stage of life. In contrast, IQ remains stable over time and does not predict success in life or relationships. Research by Goleman and others have shown that success in life and work is not determined by IQ but rather by emotional intelligence (EQ). The brightest students do not necessarily become the most successful. The emotionally intelligent person is the one who is aware of his own feelings, moods, assets and limitations and is sensitive, empathic and compassionate to others. He or she has the capacity to actively listen to others, give feedback and positively influence others that lead to win – win situations. By improving your emotional intelligence you will be better able to positively influence both your overall performance and well-being, and get incredible results from your work and life. A growing body of research suggests that emotional intelligence is a better predictor of success that the more traditional measures. 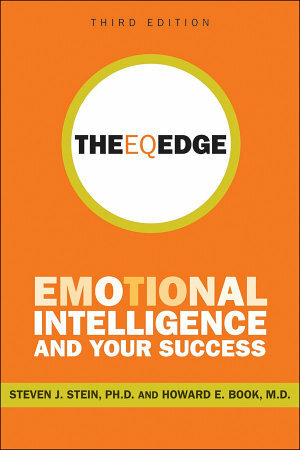 In fact, EQ may be the single most important factor in predicting success. There is now a considerable body of research suggesting that a person’s ability to perceive, identify, and manage their emotions provides the basis for the kinds of social and emotional competencies that are important for success in almost any job. This research indicated that only 20% of your success is contributed by your IQ. With 36% attributable to your emotional intelligence. At least 90% of the difference between outstanding and average leaders is related to emotional intelligence and explains why some people excel while others of the same caliber lag behind. It has been clearly established that emotional intelligence is linked to important work-related outcomes such as individual performance and organizational productivity. Emotional Intelligence matters most in times of change. It is a measure of your ability to recognize and manage your own feelings and those of other people (staff, colleagues and customers) to produce results and traditional management skills. It is equally important when selecting the next generation of leaders. How do issues like substance abuse, anger management and violence relate? They are the result of unresolved conflicts relating to personal growth and a lack of knowledge about the process of making positive personal changes. Self-defeating and destructive living patterns are the result of learned behavior, any behavior which is learned can be unlearned. When you work with other people, your relationship with them can really matter. Using emotional intelligence is all about getting the most out of these relationships in ways that benefit everyone. Whenever you need to work with other people to deliver business outcomes, having the skills to work effectively with them will help you create a better solution and stronger relationships. When you learn to recognize other’s emotions, you immediately begin to have greater empathy with them and to better connect with them. This gives you an advantage when working in a team. Sometimes we respond to situations and people in ways that we may regret. It’s harder to rebuild bridges than it is to establish them. Using emotional intelligence allows you to develop strategies to respond to others comments, incidents and events that would normally push your emotional buttons. It’s never easy to deal with conflict, but when you are aware of what drives conflict, you will be able to not just cope with the situation, but be able to diffuse the emotions that always accompanies conflict. When you know your own skills and abilities, you can focus on developing in areas that will benefit you most. Emotional Competency: constitutes the capacity to tactfully respond to emotional stimuli elicited by various situations, having high self-esteem and optimism, communication, tackling emotional upsets such as frustration, conflicts, inferiority complexes, enjoying emotions, doings what succeeds, ability to relate to others. Emotional Maturity: constitutes evaluating your own emotions and those of others. The capacity to identity and express feelings. The ability to balance the state of your heart and mind. Being adaptable and flexible, appreciating other’s point of view, developing others, and delaying gratification of immediate psychological satisfaction. Emotional Sensitivity: constitutes understanding the threshold of emotional arousal, managing the immediate environment, maintain rapport, harmony and comfort with others, letting others feel comfortable in your company while you feel comfortable in your own skin, empathy. Customer Service: learning how to help your customers feel heard, understood, helped, served, respected, valued and important. Hiring: Selecting employees with relatively high emotional intelligence, emotionally sensitive, aware, optimistic, resilient, positive, and responsible. Turnover: Reducing turnover, reduction through helping employees feel appreciated, recognized, supported challenged, rewarded and respected. Training: Raising emotional intelligence at all levels of the business through emotional literacy and emotional intelligence workshops. Corporate Culture: Creating an environment where employees feel safe, trusted, special, needed, included, important, cooperative, focused, productive, motivated, respected and valued. Productivity: Developing intrinsic motivation. Increasing employee commitment, cooperation and cohesion. Reducing lost time spent on conflict, turf-battles, defensiveness and insecurity. Goal Setting: Setting goals based on feelings and hard data. For example, stating the goal that we want customers to feel satisfied, appreciated, and setting similar goals for employees. By adding emotions to Goal Settings it keeps direction appealing to the human side of goals and for better outcomes. Seek feedback on feelings, measuring and tracking performance. Often a second round is required with adjusted goals to get to the expected finish line. Leadership: A leader with high emotional intelligence is emotionally aware. This means that he or she is aware of his own feelings and is not limited to logic, intellect and reasons when making decisions and managing people.